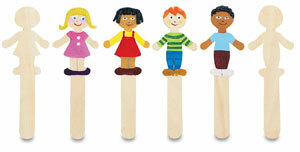 This package of 18 boy and 18 girl shapes is ready to come alive as children decorate them. The possibilities are endless as they use markers, paint, yarn, glitter, and more. They are made of smooth, natural wood. Use them to help teach geography and cultural diversity lessons.